This post is the first in our “From start to finish” series, in which I’ll take you through our 12 step program for fiber addicts. Actually, it’s more like 6 steps, but that’s not as catchy. These posts take a while to put together so they’ll be dispersed over the next few weeks, mixed in with the usual antics from the ranch. And I have to give a shout out to a reader for suggesting it, so thanks Audrey! 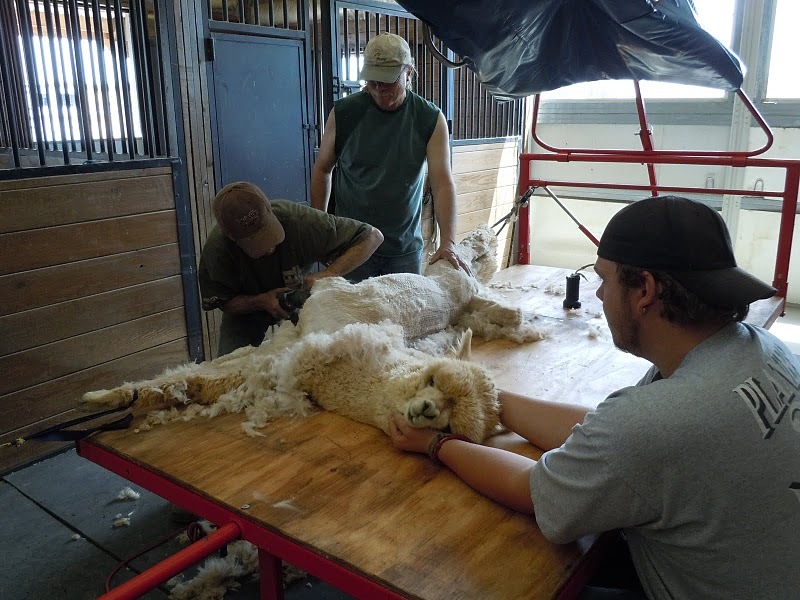 Today we’re talking about shearing. This is Morocco, the morning of the shearing. He needs a trim! It gets hot under all that. The biologist in me says that the first step to making yarn is the birth of the alpaca, but lets start with when the fiber gets removed from the animal. 🙂 Shearing day is the day around which all other days revolve on an alpaca ranch. We shear once a year, although in the high Andes where it is colder, I take it they go for two years. We were lucky to get a shearer, even though we started looking 4 months before they were due for a groomin’. Our shearer is a relatively new face on the block, though he was trained by the great New Zealand shearers who dominate the business. Frankly, I’m not sure I want to divulge his name, as he was great and we want him back next year. Find your own awesome shearer. 😛 Also, I can’t remember it. Anyway, part of what makes him so awesome is his setup. It was designed by those klever kiwis to reduce stress on the animals. The table rotates so that the flat surface is vertical. 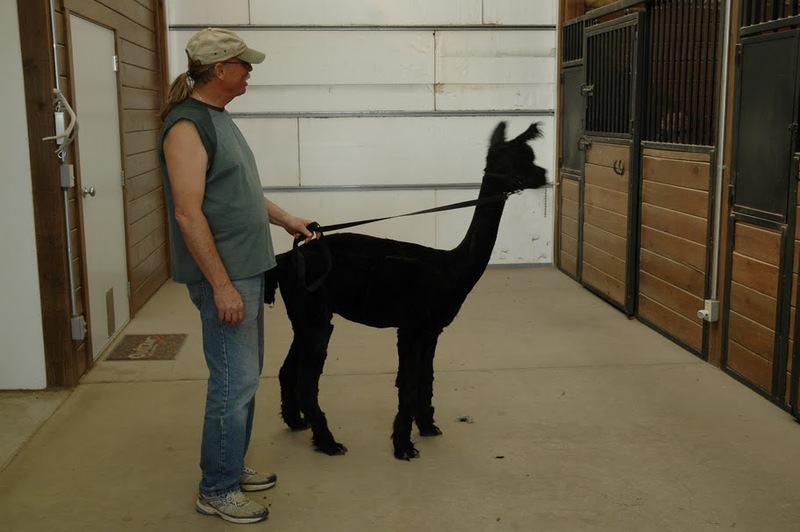 The alpaca stands next to it, and a giant vice thing clamps across their belly, holding them against the table. Then the table rotates so the alpaca is laying on his/her side on the table. Then the shearer does his thing. He uses electric shearers, the only electric equipment we use during the entire yarn making process. My bro holds Morocco's head steady while he gets sheared. Dad stands by to remove the fiber. The fiber has different uses, depending on where it comes from on the alpaca’s body. The prime fleece comes off the sides and back, our shearer removes it in two sections. To show a fleece you should keep it in one piece, but we use our fleeces pretty much right away. We like to lay one side on a painter’s tarp, put another layer of tarp down on top of that, and then put the other side down. The prime is then carefully rolled and slid into a plastic (garbage) bag labelled with the animal’s name and the year. Leg and neck hair is not as soft as prime, we put that in a different bag, also labelled, and use it for making felt. Some of the fiber, the very dirty and short bits, we discard immediately. I hear you can leave out for the birds to use as nesting material. Brittany looking shocked after being sheared. How rude! After the shearer does one side, he lowers the vice thingy, and somehow or other the alpaca gets flipped to the other side. I honestly don’t remember how it worked. I was in the grips of fiber lust after a year-long fast from raw fleece. The alpaca is only on the table for 20 minutes or so, and our shearer and vet both took advantage of having them secured to do some yearly maintenance. Teeth got filed, toe nails got trimmed, and shots were administered. 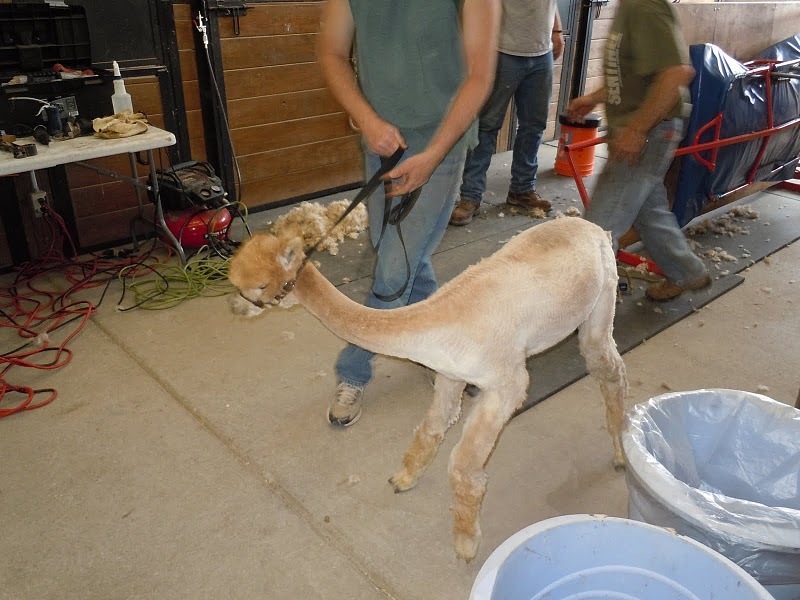 Tuscany gets his teeth filed after he is sheared. My bro holds his mouth open. All in all, a pretty sucky day if you are the alpaca. You start out all regal and majestic, and end up all silly and skinny, not to mention the indignity of being flopped around on a table. They protest in the usual alpaca ways, from disgruntled looks, to humming, to spitting and screaming. None of our herd got that far though. Even Mikayla, who is the queen of her private universe, didn’t think it was that bad. The worst we had out of any of them was a sort of high pitched humming whine. It’s kinda a “Hmmmmmmnnn!” sound. Really hard to duplicate over the internet actually. An after picture of Morocco, just off the table. The bags are stored until they can be skirted, which is part two in this little series. We store in plastic, but we don’t seal the bags, because we don’t want mold or ickies growing in there. In Colorado, the fleeces store really well, though you want to protect them from the usual vermin, moths and mice. Cedar chips work well. This entry was posted in fiber art and tagged alpaca ranch, alpacas, fiber, shearing, shearing day, yarn. Bookmark the permalink. Wow that is really interesting. Can’t wait for part two. 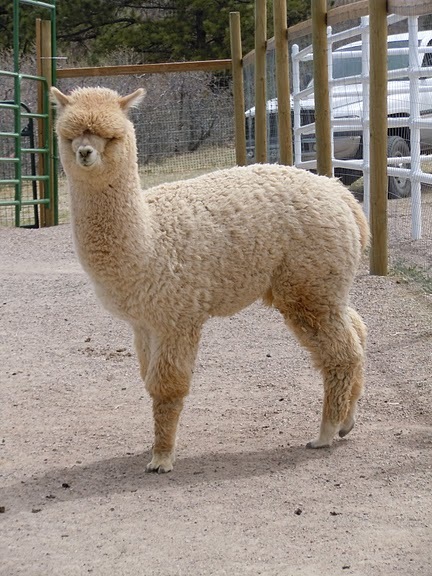 Do Alpaca’s get fleas or other critters that have to be disposed of? I suppose it depends on where they live. Fleas aren’t too common in Coloardo to start with, so we don’t worry about those much. They do get ticks, however. I think we had one tick this year on one of the boys. You can pretty much only find them during shearing, but they don’t seem to be a serious problem. They keep clean by taking “sand baths”, rolling around in sandy gravel to scrape off parasites and such. Alpacas don’t do as well in humid places, higher incidence of parasites being one of the main reasons. Actually we have a vet following, the blog…if anyone has other/more info, feel free to jump in! you can tell I’m an East Coaster LOL! I think of the critters here and we are always concerned about those things. Yay! This is great! I’m looking forward to the rest of the steps. What a great post (as always!). I laughed out loud multiple times which was somewhat awkward considering I was sitting at the brewery alone in Grand Junction. People definitely looked at me weird!!! Alpacas are inherently comical, it’s true. 😛 Funny bunnies! Mom’s already done with one of your scarves. I’ve been a bad girl about spinning, though! I so need to get on that.